After completing his training in Canada, his first overseas posting was to No.22 O.T.U. around July of 1941. It would be at the Operational Training Unit that Sgt. Roger O'Brien would crew up with other men of different trades to make up the crew of a bomber, in this case a Wellington. The training was just under 68 hours flying time. Performing numerous landings and takeoffs in quick concession, called Circuits and Bumps. The crew would learn to work together on long range navigation exercises and perform "Nickel" drops on occupied Europe. All this was to gain experience in front line conditions and for the crew to work as a team. Since the aircraft he was to use during his operational service was to be Wellingtons there was no addition step before being posted to a front line squadron. In later years with the introduction of the four engine "Heavies" crew would spend additional training time at a HCU. But at this point in the war Halifax, Stirling and Lancasters were not widely in service. Sgt. Roger O'Brien's next posting after OTU was with 405 squadron. Were he spent many trips doing "Air Tests" and cross country hops around the English country side. All of which sounds to many like an easy going experience, that is until you look at the statistics of the numbers of crews who were lost during these seemingly easy rides in their new "kites". Anytime you were aloft there was danger all around you. Mid-air collisions, hills that pop up in front of the aircraft suddenly or engine failures on take off or landing all took their toll of not only aircrews but also ground crewmen as well. Sgt. O'Brien along with his pilot Sgt. Graham did fly on a number operations over enemy territory, Cherbourg, Edden, Brest and Boulogne amongst them while with 405 squadron. On February 12th of 1942, Sgt.Graham and Sgt. O'Brien were posted to 419 Moose squadron. He flew one more time with Graham while at 419, but that was all that are listed. Starting on March 28 through until May 5th of that year Sgt. O'Brien was Air Gunner with the crew of F/S Frank Pikula. 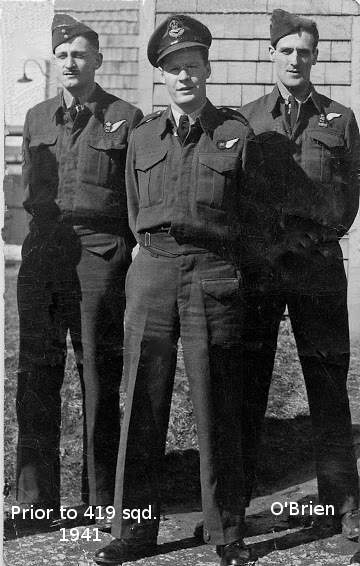 Together with this crew he flew on at least ten operations, also during this time he flew one operation as gunner and second WAG with W/C "Moose" Fulton's crew. During early May while O’Brien was on couse, F/S Pikula and crew were lost on an operation on May 17th. It must have been an emotional return to the squadron to learn of the loss of his crewmates who he had flown with on so many previous operations. 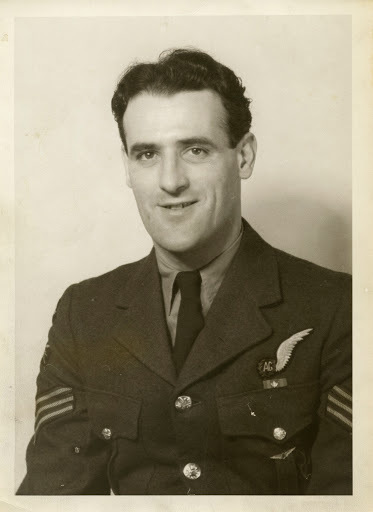 In his operational service years he would fly with four crews who would be lost while he was not flying with them. On May 30th, he began his air operations again with another crew captained by P/O Fillmore. With Filmore's crew he would fly another eight operations completing his time with them on July 7th. He did also have one more operation flying, with the squadron's namesake Wing Commander, John Moose Fulton during that time. At this point his tour of 30 trips (combination of 405 squadron and those with 419) was complete continued on in the air force in the role of an instructor in operational squadrons. In the following story a 25 year old Wireless Air gunner from Quebec City tells his impressions of bombing flights over enemy territory. Thirty trips in the front turret of a big bomber have earned him another six months instructing at an operational training unit. We lost "Fudge", our rear gunner, one night coming back from Emden It had been a "shaky do" things don’t always go just right and we hadn’t been set to take things easy until we were well on our way home and out of the colored flak. Just as we relaxed, we ran into a balloon barrage. Wireless noise was interfering with the instruments but we could hear the captain swearing. At one moment we heard him say... "We’ll have to get out of here." He did get us out of it and when we landed and crawled out of our kite one after another, there was no Fudge. We searched high and low but he was gone. The next morning a weary looking (Sgt.) Fudge staggered in carrying his parachute. He explained his disappearance. Back when we were caught in the balloons, he had heard the captain’s words’ get out of here .." through the wireless noise and taken them for an order to bail out. Last September when I made my first operational trip, there was a similar skirmish with balloons. We had been to Ostand that time and got mixed up in the barrage on the way back. I hollered a warning over the intercom and the captain just said" OH OH ! ", twisted the kite around and got us out without too much trouble. But the first balloon incident taught me a bombing flight is never over until your kite is back home on the ground, even if it’s coming smashing in on it’s belly in a crash landing. Balloons are the least or our trouble. There’s flak over there above every target. It bursts so close it seems miraculous that the kite isn’t cut through and through. The coloured stuff is pretty but wicked. When it hits you squarely you don’t know if you’ll get home or wind up in the sea. I had been told all about flak and thought I knew all about it and searchlights before I ever made my first operational flight. But it was only after I had ridden to Hamburg, Wilhelmshaven, Emden, Stettin, Cherbourg, Boulogne and Breast, that I found out how to take things easy and sit in my turret in comfort. When I started on operations the weather was bad night after night………. But my last seven flights took only nine days because we had fine weather of the moon period. My recollections of my 30 trips are mixed. The Renault do was the first smasher and, as the boys said, we queued up to make over bombing runs at 2,000 feet. I only remember bombing from a lower altitude once. That was at Rostock when we went in at 1,000 feet. They were other kites lower though – we could see them outlined below us by the big fires. The 1,000 –kite jobs on Cologne, Essen and Brest were comparatively easy as far as opposition was concerned. But we had to be careful not to bump into our own aircraft. My number 13 flight didn’t worry me particularly because I’m NOT superstitious. It was a lucky flight. A flak shell went through the wing of our Wimpy (Wellington) and it was lucky it didn’t explode. My first "shaky do" was a trip to Base. A "shakey do" is a trip when things have a tendency to go wrong. Our engines cut out twice that night just when the captain was putting us through violent evasive action to get away from searchlights and flak. Another night when we were out to Kiel we got caught in a box barrage. It took us a half hour to break our way through those walls of light and flak hemming us in on four sides. My 29th trip was one of easiest. I didn’t have to worry because the squadron commander was at the controls, the squadron gunnery leader was in the rear gun turret, the squadron signals officer was on the wireless and the squadron navigational officer was our Observer. We were bombing Bremen and four night fighters came after us. The squadron commander easily got us away from them. During one attack he twisted the kite around to put the Jerry kite in my sights and give me a crack at him. Four of the crews with whom I’ve flown during my trips have been lost. I just didn’t happen to be with them on those flights. Once it was because I was grounded with an attack of the flu. Another time I happened to be away on a short course. I guess I’m lucky to be able to go on this instructing job.